Choose your keywords to track your website’s ranking on Google, Bing or Yahoo. More than 300 extensions are available. 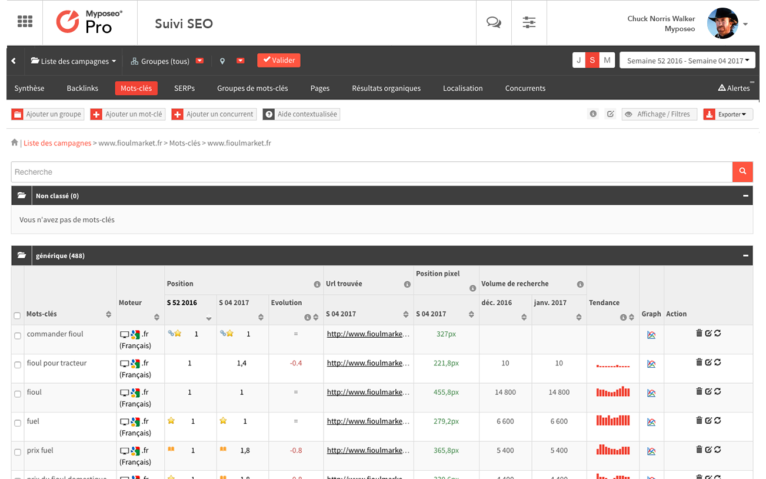 The SEO tracking tool collects daily the SEO position of your site and your competitors in search engines pages. Track the performance and SEO ranking of your keywords on a daily basis and focus on optimisation! 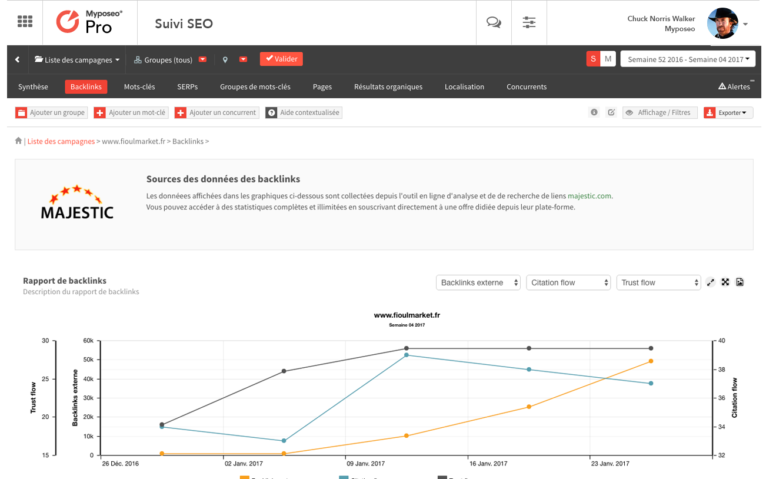 The SEO analytics dashboard allows you to analyze all the data in your account and thus compare the large-scale performance of your website in SEO. PosRank is a unique indicator of 0 to 100 allowing to know the website globale position on a set expressions. 100 being the best possible score (if all the website’s keywords are in 1st position). Attendance rate helps you to know the number of keywords on which one advertiser is present. One website present on 2 keywords by 10 has 20% attendance rate. We calculate the average position of your keywords and groups over weekly and monthly periods. We estimate the generated traffic by your position on search engine based on CTR (click through rate), monthly search volume and your position. 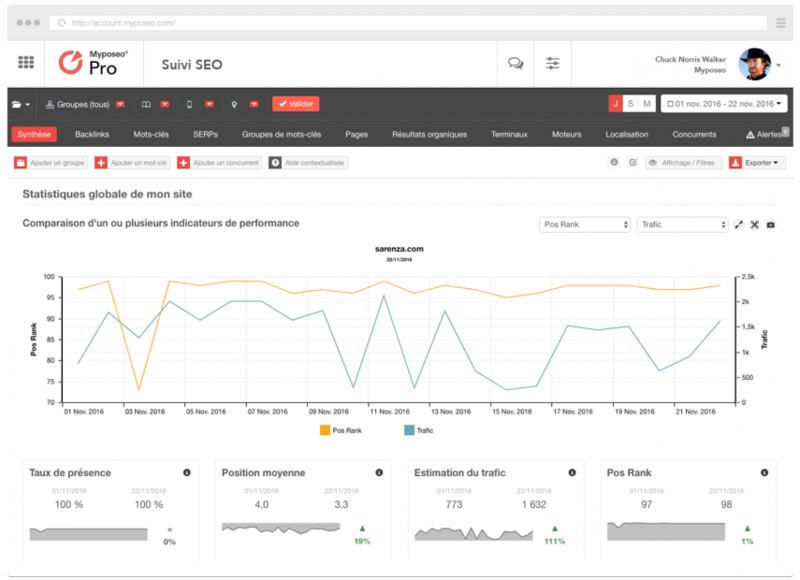 Linked to Majestic SEO, the netlinking synthesis groups the KPIs of your performance and allows you to analyse the collected data in global way. Available on Google, Bing and Yahoo on over 300 extensions and in all languages. Rank tracking is the foundation of your myposeo SEO analysis. Track URLs and pages ranked in SEO. The tracking of URLs ranked on your site on search engines allows you to know the number of URLs ranked on your keywords analysed. You will thus be able to know the most visibles pages and the keywords allowing to access them in order to optimise your presence. 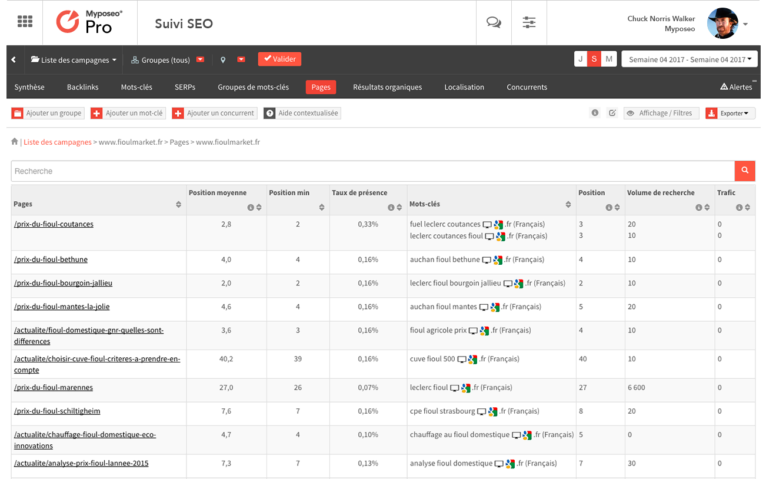 How to use the SEO Rank Tracking tool? Consult our use cases dedicated to the SEO rank tracking tool. Learn how to use Myposeo Pro to track and optimise your website’s visibility.